When a space explorer carries an alien creature onboard his cargo ship, it doesn't seem like a big deal. That is, until it bursts out of the chest of its human host (OUCH!) in one of the most-famously shocking scenes ever. At first glance, the creature is only about the size of a small dog, but before long, Weaver and shipmates are on-the-run from an ever-growing man-eating mutant. And you know, "in space, no one can hear you scream." 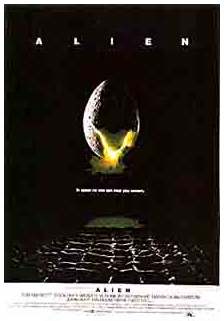 It is hard to believe that it was made more than 20 years ago, and that it was only Ridley Scott's second film. The original Alien was - and still is - one fascinating and fantastic wild ride. If you, like me, were too young to see this great film in its original theatrical run, 20th Century Fox is re-releasing a digitally remastered "Director's Cut" on October 31, 2003! "The scariest movie of all time is back," proclaims the Alien site at foxmovies.com. "Experience it in theatres this Halloween."